At an altitude of 12,000 feet, the city of Leh in the Indian region of Ladakh is one of the highest in the world and has one of the harshest climates—temperatures reaching -30°C, low air pressure and very little precipitation. Roads to Ladakh remain closed for 6 months of the year, making access difficult. Increasingly erratic weather patterns caused by global warming are affecting water supply and agricultural production, in turn threatening the safety and self-sufficiency of the entire region. Due to its geographic isolation, Ladakh’s traditional way of life is highly sustainable and self-sufficient. But modern habits and an influx of tourists over the past 10 years (270,000 expected in 2017) are wreaking havoc on the region’s ecology. Plastic waste, traffic jams, flush toilets, massive amounts of construction—all are threatening the fragile ecosystem and polluting natural resources. About 60% of Ladakh’s water supply is drawn from pure underground sources and often drunk without filtering. But as flush toilets become increasingly popular, more sewage is discharged into underground septic tanks and pits, releasing toxic overflow into the soil which can easy leach into and contaminate groundwater. The city of Leh (pop. 45,000) is constructing a sewerage system that may eventually cover 40-50% of the city. This could be too little, too late, as groundwater contamination would have disastrous effects on public health and tourism. Many other Indian cities, including Shimla, have seen cholera and jaundice outbreaks that are traced back to similar pollution of water sources. 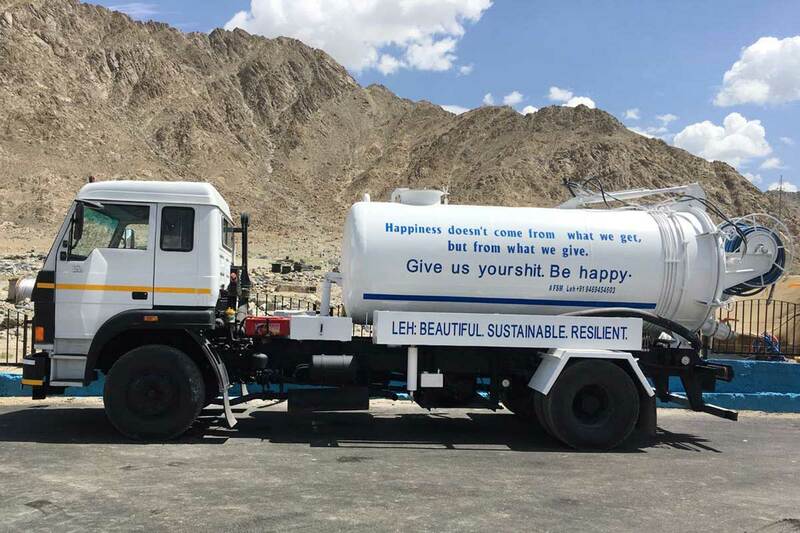 With these concerns in mind, the Ladakh Autonomous Hill Development Council (LAHDC) visited Devanahalli (near Bangalore) in early 2017 to learn about the faecal sludge management (FSM) system put into operation there by BORDA and its partner CDD Society. In Devanahalli, LAHDC representatives were able to witness first-hand the transformative effects of town-scale FSM and envision its contribution to protecting the environment and water supply in Leh. 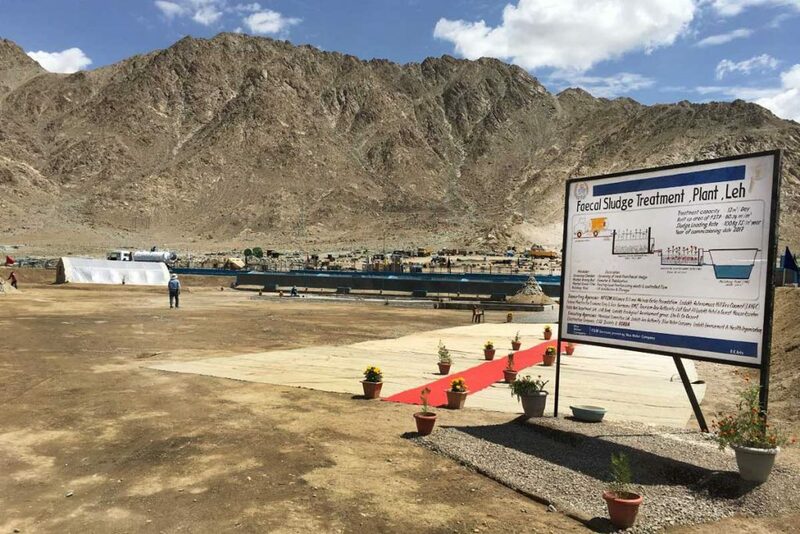 BORDA followed up with a visit to Leh to conceptualize an FSM system for the city that complements the sewerage system currently under development. Leh’s new FSM system, implemented in three months, was inaugurated in August. To support the Municipal Committee of Leh (MCL) in managing and paying for the FSM system, BORDA invited the Blue Water Company (BWC) to set up India’s first FSM public-private partnership (PPP) in order to finance, design, build, operate and transfer the entire FSM system. The Leh FSTP serves as an example of a treatment plant successfully built and operated despite extreme geographic and climatic challenges. 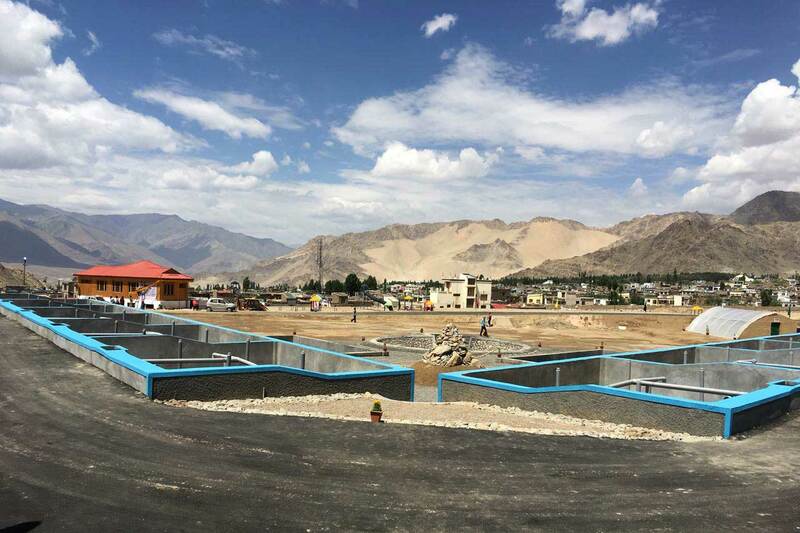 It is also an example of what can be accomplished through innovative public-private partnerships, with the contributions of multiple stakeholders such as BORDA, CDD Society, and the Blue Water Company, and the support of municipal actors such as the Leh Development Authority. The Bremen-based international company HANSA-FLEX selected the Leh FSM project for their 2017 Christmas donor initiative. The new system, implemented at 12,000 feet via an innovative public-private partnership, shows that successful FSM is possible even in very challenging conditions.